Is there more to the MacBook than its touch panel? We'll be honest. We didn't have high expectations. The MacBook Pro has been largely untouched for four years, and the rumors and leaks indicated that while a refresh was coming, it wouldn't be jaw-dropping. We'd love to say that Apple confounded our expectations - but did they? The short answer is “hmmmmm”, and the long answer is “hmmmmmmmmmm”. There's little doubt that the new MacBook Pro is the best laptop Apple has ever shipped, with some superb feats of engineering and some really interesting ideas. But given the lack of an update to the iMac and Mac Pro, is the new MacBook Pro range enough to mollify the increasingly unhappy pro market when Microsoft has just dropped the extremely impressive Surface Studio with Surface Dial? The 2016 MacBook Pro was launched on the 25th anniversary of Apple's first notebook, the first Powerbook. After a lengthy recap of the various notebook innovations Apple delivered over those 25 years, Tim Cook showed us this generation's big idea: a retina multi-touch panel, which Apple calls the Touch Bar. It's not just a menu bar but a timeline and scrubber for video or photos or music, a slider for track volume, the favourites buttons for your web browser, autocorrect for your typing or anything else app developers fancy using it for. You can also customise it to have your own commands on it instead of the standard system controls. It's very clever, and of course it includes TouchID too. That boosts security, makes user switching a one-tap affair and enables you to use Apple Pay online. It's an interesting alternative to the touch-based notebooks we've seen from Windows manufacturers; Apple clearly believes that you should keep your hands on the keyboard instead. The 13-inch MacBook Pro is just 14.9mm thick - a difference of 17% compared to the previous MacBook Pro, and it's lighter too. So is the 15-inch model, which is now 15.5mm compared to the 18mm of its predecessor. 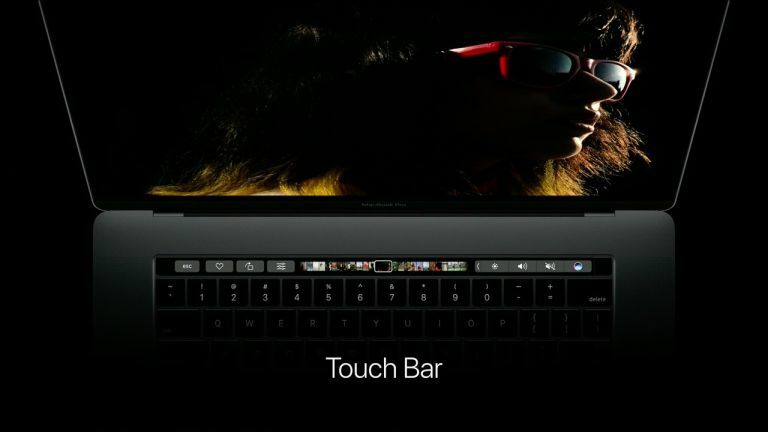 Both devices get a new Force Touch trackpad that's twice the size of the previous version, a new version of the butterfly keyboard we first saw in the most recent MacBook, and the widely leaked Touch Bar that replaces the function keys. The 15-inch is 67% brighter, has 67% better contrast and displays 25% more colours than the outgoing model. Battery life is a claimed 10 hours. Inside the Mac there's a quad-core Intel Core i7 with 2133MHz memory, Radeon Pro graphics using AMD's Polaris architecture and a faster SSD of up to 2TB with 50% faster performance. Apple reckons that the cooling system is quieter and the speakers much louder than before. The 13-inch has a choice of dual-core Intel Core i5/i7 with Intel Iris graphics, and again the SSD is twice as fast as before. There's a second 13-inch, designed for MacBook Air customers. It doesn't have the Touch Bar and has two, not four, Thunderbolt 3 ports. Both Touch Bar versions of the MacBook Pro have four Thunderbolt 3 ports, delivering 40Gb/s bandwidth, 10Gb/s USB 3.1 and with each port able to choose between being a power port, a USB port, a Thunderbolt port… that's really clever, and genuinely useful to pros who need to connect all kinds of devices. Apple demoed the 15-inch model running two 5K displays and two RAID storage arrays simultaneously. Nobody used the phrase “desktop replacement”, but that's what many people were thinking during the keynote. It's worth noting that while the iPhone has dumped the headphone jack for a Lightning connection, that hasn't happened with the MacBook Pro: it has a headphone jack but no Lightning port.The MagSafe is gone, as is the SD card slot. This won't be a happy moment for UK Mac fans given the state of the pound against the dollar. The non-Touch Bar MacBook Pro starts with a 2.0GHz dual core Intel Core i5, Intel Iris Graphics 540, 8GB and a 256GB SSD. The price is £1449. The 13-inch Touch Bar MacBook Pro starts with a 2.9GHz dual-core Core i5, Intel Iris Graphics 550, 8GB of RAM and a 256GB SSD. That one's £1749. The 15-inch MacBook Pro base configuration is a 2.6GHz quad-core Intel Core i7, Radeon Pro 450 graphics, 16GB of RAM and a 256GB SSD. That will cost you £2349. As ever, you can customise the configurations to the very limits of financial sense. The base 13-inch is on sale now, and the others will ship in the next few weeks.